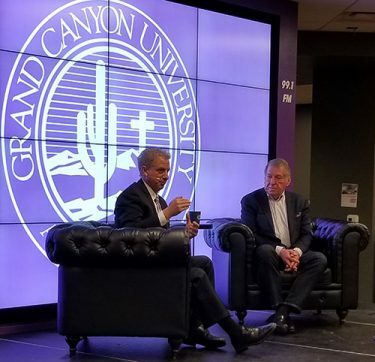 Jude LaCava (left) and Jerry Colangelo shake hands after their fourth annual talk at GCU. 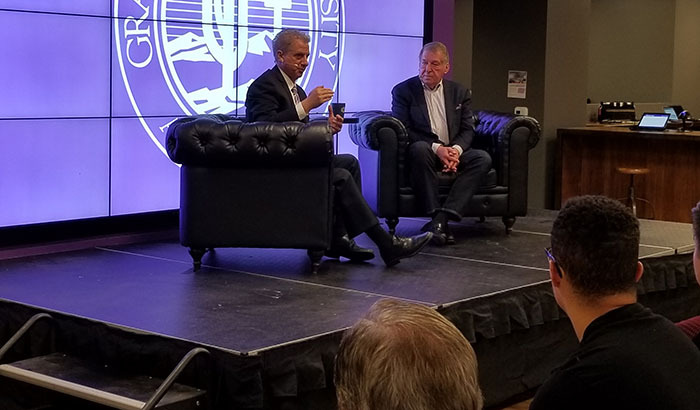 Grand Canyon University students again were blessed Tuesday with the opportunity to listen to Phoenix business icon Jerry Colangelo discuss private and public funding of sports arenas with Fox 10 sports anchor Jude LaCava. A large crowd packed the second floor of the Student Union for the fourth annual discussion between Colangelo and LaCava. 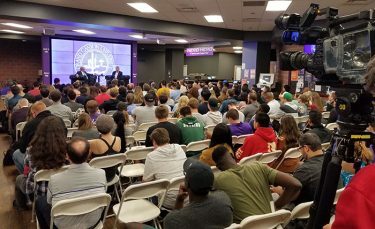 Business and sports management students listened intently as Colangelo told how he was able to help build Phoenix into a major metropolitan city through sports. But the main point he wanted everyone to take away transcended business: Be trustworthy. A large crowd turned out in the Student Union. Amid the talks of taxation, investment, innovative revenue streams and urban cores, Colangelo told a multitude of insider stories about how Phoenix’s professional sports scene came to be. He said that after relentless work in the 1980s, Phoenix awakened in the early ’90s and found triumph in its most famous defeat. It was 1993, and the Phoenix Suns had made it to the NBA Finals against the Chicago Bulls. The Suns had an outstanding regular season, earning home-court advantage over the Bulls. But Michael Jordan and company bested Charles Barkley, Dan Majerle and the rest of the hometown team in six games. After the devastating loss, 300,000 people showed up downtown in 108-degree heat to show love to the Suns. It was in that moment Phoenix evolved. A week after the gathering, Colangelo received a call about Major League Baseball. Colangelo said he took a year to do his due diligence and decided that there was a future for baseball — that its state at the time was the lowest it would be. The money trend in the baseball business was on its way up. LaCava and Colangelo discussed private and public funding of sports arenas. Couple that with a provision written into state law by a former legislator that allowed for a “baseball-only stadium,” and the Arizona Scorpions were on their way. Scorpions? Yes, that actually was the team name that won the vote. Colangelo, however, decided the second-place name was a better fit. You can do that when you’re Jerry Colangelo. The crowd loved that nugget just as much as the city loves its Diamondbacks.